Dubai’s developers of premium properties have been making subtle changes in the way they pitch their sales campaigns. While some are going all out for buyers in the other Gulf states, others have started to explore possibilities tapping cash-ready investors in the Far East. Sobha’s opening in Singapore should thus be viewed in this light. That still means there is lots to do. The developer has mounted two substantial projects in MBR City. For one, it has a joint venture with Meydan to develop the sprawling District One. 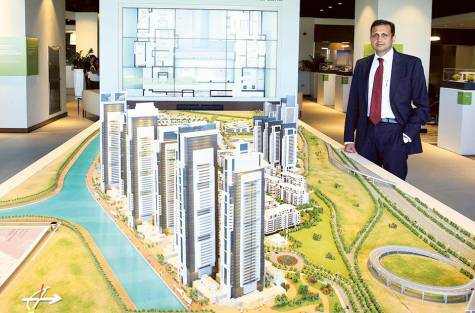 The second project, the $4 billion (Dh14 billion) Hartland, is being developed by Sobha LLC on its own. Construction work will start on the 280 villas and the ground plus eight-storey (G+8) structures (which will add 1,800 units) in the second quarter. Hartland is scheduled for completion in the first quarter of 2017. And it is also making a strategic foray into the education and hospitality sectors. Its first school will open in Hartland by September and there are plans for a second one, also at the same location. “The other way we are adding to the revenue stream is building a four-star hotel — the Strada and which will have 300 keys — at the community,” said Rajendran. “We will also be directly handling the primary retail component at Hartland. “The two additional lines — education and hospitality — should sit well alongside our core real estate development activity going forward.